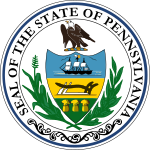 The Pennsylvania gubernatorial election of 1790 was the first gubernatorial election after the establishment of the Commonwealth of Pennsylvania as a U.S. state. Thomas Mifflin, the incumbent President of the Supreme Executive Council of the Commonwealth of Pennsylvania was elected as the first Governor of Pennsylvania. He defeated Federalist candidate Arthur St. Clair, former Revolutionary War general and President of the Continental Congress, by a wide margin. ^ "PA Governor General Election". OurCampaigns. Archived from the original on July 25, 2007. Retrieved 15 August 2014. ^ "Pennsylvania Gubernatorial Election Returns 1790". House of Representatives of the Commonwealth of Pennsylvania. Retrieved 3 July 2012. This page was last edited on 2 January 2019, at 01:23 (UTC).